The Flight is the perfect backpack for anyone on the go. 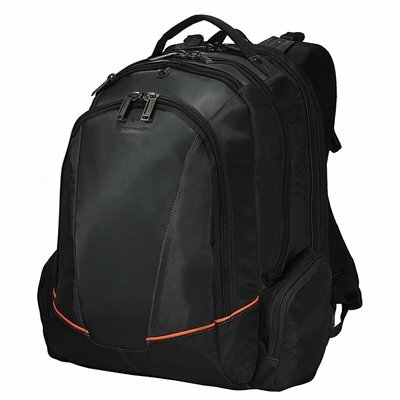 The backpack easily fits up to a 16” laptop in its ultra-soft padded and felt lined rear compartment that folds 180º open for easy access. This also allows you to pass by airport check points without taking out your laptop! Even with a full load, the Flight keeps your back and shoulders comfortable with its deep airflow channels. Balance is also maintained, thanks to the Flight’s 5-point balance strap system with a fully adjustable chest strap. 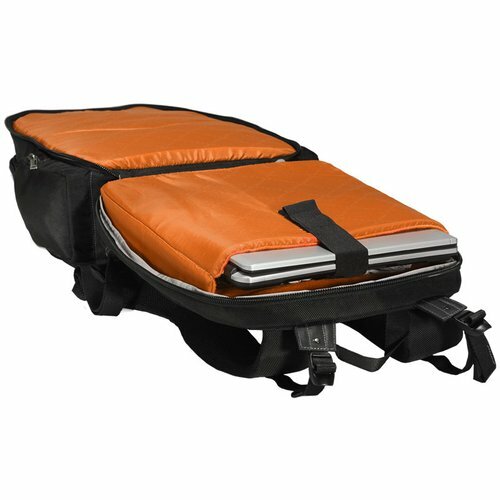 The spacious main storage compartment features large zippered pockets, dividers for keeping your documents or peripherals separated and a soft, fine-felt lined pocket that is ideal for your iPad, Kindle or other similar tablet safe and sound. 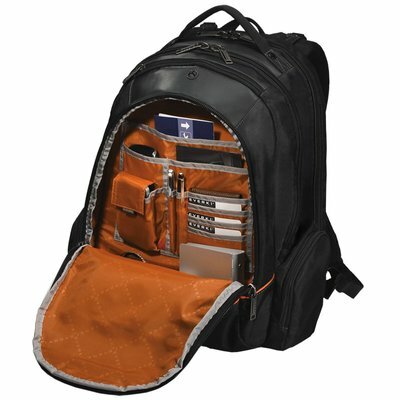 The front compartment has plenty of slots for you to store your business cards, two pens, and any other important documents or electronic components. The Flight also has a zippered, top stowaway pocket lined with soft, scratch free cloth for your music player. The stowaway pocket has a dedicated opening for your headphones to reach your player that prevents dust or rain from sneaking in. There are also two convenient side pockets that provide you with even more places to store items such as a phone charger or a compact digital camera. 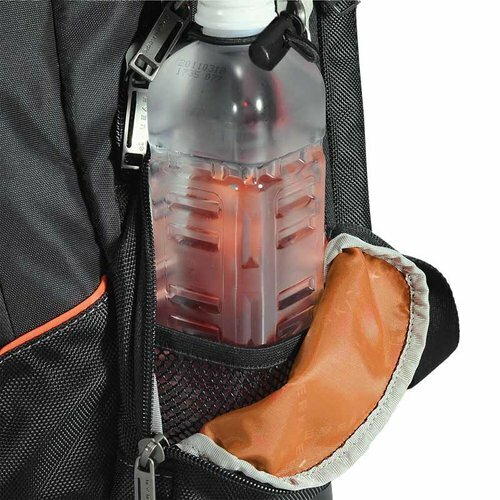 One of the side compartment pocket also has an dedicated adjustable loop to hold a water bottle in place while on the move. As with all Everki products, the Flight is backed by Everki’s Limited Lifetime Warranty and world-class customer service. Side pockets can present a burden and take away from a bag's aesthetic when designed incorrectly. The Flight was constructed with this in mind, with discrete side compartments that maintain the flow of its design, equipped with a range of slots designed to accommodate a number of everyday items like keys, flash drives, writing utensils, and compact portable electronic devices. These pockets are equipped with the same high-quality zippers and metal zipper pulls that secure the rest of the bag. Who doesn’t appreciate the convenience of portable music players, cellular phones, and other audio devices? The Flight features a dedicated audio device compartment, complete with a cable outlet that provides quick and easy, tangle-free access to headphones and other loose cables. 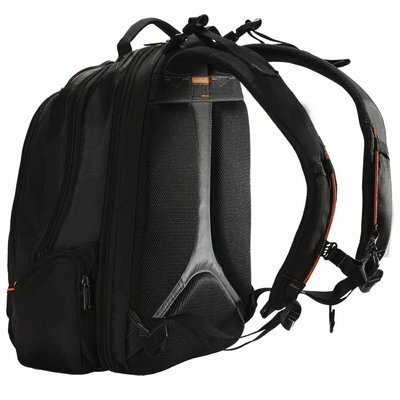 The outlet sits near shoulder level when the bag is carried on your back, significantly reducing cable slack and holding cables clear of arms, handle bars, and other hazards. Don’t let wires get in the way. Let the Flight help you make the rat’s nest a thing of the past. With a dedicated slot designed to hold your iPad and other tablet PC’s, never again will you leave your device vulnerable to the ravages of an ill-fitting compartment. The rising popularity of tablets and their increasing importance in school and industry make this feature a must when purchasing a new laptop bag. 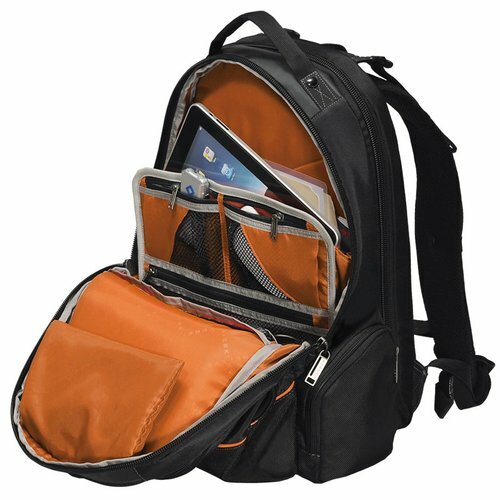 This unique pocket is lined with the same soft felt that is found in the laptop compartment, so you can rest assured that your iPad or tablet PC will be just as well protected as your computer, and like all of the Flight’s pockets and compartments, it is easily accessible. It is no myth that airport security checkpoints impose more and more rules and restrictions all the time. Breeze through security with the Flight’s Checkpoint Friendly laptop compartment. Simply open the compartment 180 degrees, lay it flat on the conveyor, and watch your laptop go through the x-ray machine without the mess and inconvenience of removing it, and should you for any reason be required to take it out of its slot, you can do so easily, without rearranging the rest of the bag’s contents. Fast, simple, and effective. Today’s tech-savvy traveler needs a bag that can carry a lot of weight without adding to it. The 5-Point Balance Strap System distributes weight load evenly across the torso to reduce muscle strain and keep you feeling light on your feet with every step you take while wearing the Everki Flight. 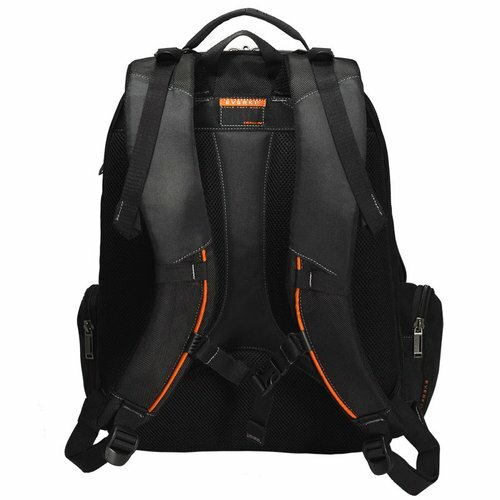 Like most bags, the Flight has two adjustable straps at the bottom. Everki adds to this two adjustable straps at the shoulders and one across the chest that give you more control over weight distribution and, ultimately, greater comfort. Carrying a laptop and all of its accessories can wear a person out pretty quickly. Luckily for the weary traveler, the Flight is designed with pillow-soft shoulder straps and padded back panel that pitch in to help you shoulder the load when you have to carry your gear for long periods of time. Mesh padding and deep airflow channels also allow for maximum air circulation to keep you dry, cool, and comfortable, even while you are in constant motion. You can enjoy peace of mind knowing that with any product in the Everki family, you never have to worry about discovering a flaw or defect after the end of the warranty period. Everki’s Limited Lifetime Warranty protects your purchase against manufacturing defects over the entire life of the product. Organizing your belongings can demand more attention than it deserves. That is why Everki outfitted some of the Flight’s many pockets with a see-through mesh covering that makes finding and accessing everyday items like keys and small objects a cinch, even when the bag is stuffed full. Your laptop is one of your most prized possessions, so it deserves its own compartment. 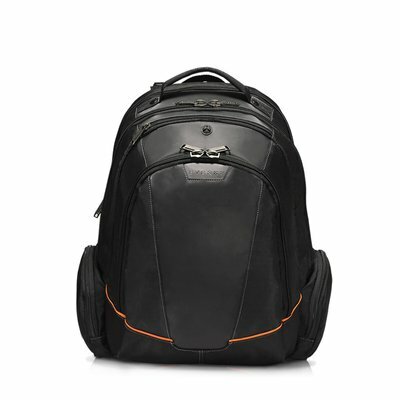 This compartment is equipped with a felt-lined pocket with ample padding to best protect your laptop from bumps and scratches, and further secured with lock-holes on the compartment’s zipper pulls. 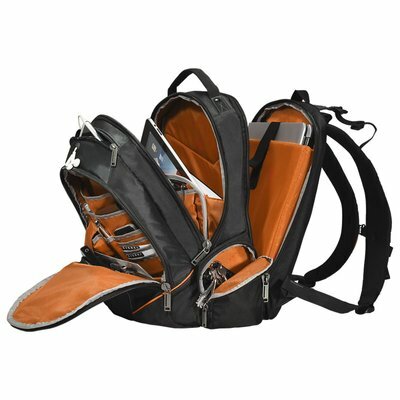 The Flight’s size 10 zippers are larger and more durable than the hardware found on most other bags in its class. Its strong, all-metal Everki zipper pulls are built to last and the laptop compartment features pulls with lock-holes to help you protect your valuables while you are on-the-go. Convenient mini straps on the front of the Flight’s shoulder straps allow you to temporarily store and retrieve items like sunglasses and ear buds quickly and easily when you are at the cash register or making your way through check-in at the airport, making for a smooth transaction without added hassle. The serious traveler works up a thirst and doesn’t want to have to hold on to a water bottle or fumble around for it in an overstuffed compartment. The Everki Flight comes equipped with a unique loop strap in one of its side pockets that securely holds a bottle in place. Need a drink? Problem solved.